Central America is the relatively narrow isthmus of land that extends over slightly more than 2,000 kilometers from the southeast border of Mexico to Colombia on the north coast of South America. 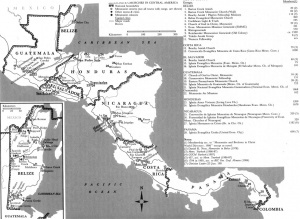 Historically, Central America consisted of the five countries Guatemala, El Salvador, Honduras, Nicaragua, and Costa Rica, but now Belize on the northeast and Panama on the south are also seen as part of Central America. In the 1980s this whole area with the inclusion of Mexico was referred to as Mesoamerica. The first Mennonites to live in Mesoamerica were the Old Colony Mennonites who migrated to Mexico from Canada in the early 1920s. Less than 40 years later about 4,000 of these Mennonites moved from Mexico to Belize, again in search of guaranteed freedoms for their agriculture-based, isolated religious communities. Mennonite mission activities in the Mesoamerican region began in 1950, when the Eastern Mennonite Board of Missions and Charities of Lancaster Mennonite Conference (MC) began a mission in Trujillo, Honduras. Beginning the following year the board also sent nurses to operate medical clinics and North American youths for development work. These became known as Overseas Voluntary Service Units that continued for more than a decade. A similar strategy was followed when other Mennonite mission boards opened work in neighboring countries. In the late 1950s the Franconia Conference (MC) sent missionaries to Mexico City and the Pacific Coast Mennonite Conference (MC) mission board opened work in Sinaloa in northeast Mexico. In the decade of the 1960s and the early 1970s there was a flurry of Mennonite mission activity in Central America. Many Mennonite mission efforts included personnel to minister to both spiritual and social needs. Rosedale Mennonite Missions of the Conservative Mennonite Conference (MC) began in Costa Rica with both missionaries and voluntary service units. In Nicaragua nurses and volunteer workers preceded missionaries, who then worked with the new groups of believers already begun. The Conservative Mennonite Fellowship assigned missionaries to work among Cachiquel Indians in western Guatemala. A few years later some of these workers organized a separate program under the name Mennonite Air Missions. A similar group, Caribbean Light and Truth, began in southern Belize. Eastern Mennonite Board of Missions and Charities sent personnel to Belize to work with the Old Colony Mennonites and to start new Mennonite churches. They also assigned workers to establish Spanish churches in Guatemala City and among the K'ekchi Indians in northern Guatemala. The Brethren in Christ transferred their first missionaries from Cuba to Nicaragua. The Evangelical Mennonite Conference of Manitoba, Canada, sent both missionaries and voluntary service workers to Nicaragua. The Mennonite Brethren sent missionaries to work in Panama as an outgrowth of their program in Colombia. The Beachy Amish Mennonite mission and development board, Amish Mennonite Aid, sent volunteer workers to El Salvador and later sent their first missionaries to El Salvador and Belize to establish an orphanage and churches. Single short-term volunteers generally worked in supportive roles with their missionaries. Beachy Amish groups also established small self-supporting communities in El Salvador, Belize, Honduras, and Costa Rica. In the early 1970s Eastern Board missionaries, Ed and Gloria King, began a youth ministry, Amor Viviente, in the capital of Honduras. Following relief work after the 1976 Guatemala earthquake, the Church of God in Christ Mennonite (Holdeman) mission board sent missionaries to establish churches north and east of Guatemala City. The Iglesia Evangélica Menonita del El Salvador [Metapán] (Evangelical Mennonite Church) in northern El Salvador was started in the early 1980s by former members of the Iglesia Evangélica Menonita Hondurena (Honduran Mennonite Church) who migrated to El Salvador and by Honduran Eastern board missionaries and pastors. Most of these missionary efforts included efforts to train national church leaders as they participated in the different aspects of ministry. After the three consecutive natural disasters in the 1970s (an earthquake in Nicaragua, hurricane Fifi in Honduras, and another earthquake in Guatemala), Central American Mennonites, including from Belize, worked alongside their North American sisters and brothers in relief efforts. This relief work, the earlier service projects and teaching, and continuing Mennonite Central Committee (MCC) involvement in development work in the region have encouraged the conferences to develop a wholistic concept of the gospel. Several of the conferences now have their own social service committees and are coordinating their involvement with various international organizations in working in service projects and with refugees. Since 1973 an annual Consulta Anabautista Menonita Centroamericana (CAMCA; Central American Anabaptist Mennonite Consultation) has been held by national and missionary church leaders. This regular interchange in alternating countries of the region has provided a significant opportunity for the development of an area ministers' manual, Bible lessons for new believers, and a hymnbook. CAMCA also served as a forum for the development of a regional leadership training program beyond the level of Bible institute studies. It is known as the Seminario Ministerial de Liderazgo Anabautista (Anabaptist Ministerial Leaders Seminary), SEMILLA. This extension Bible training program begun in 1983 has a regional board of directors made up of national, rather than expatriate, members and is helping the different groups of Anabaptist origin to develop a common vision and identity. As a result of these missionary and church activities, in 1988 there were a dozen organized national church conferences and several more recognized mission groups. The total of all these, not including the colony Mennonites, exceeded 13,000 baptized members. These were approximately 335 congregations which were, with a few exceptions, led by national pastors who had only occasional contact with foreign missionary personnel. Kraybill, Paul N., ed. Mennonite World Handbook. Lombard, Illinois: Mennonite World Conference, 1978. Mennonite World Handbook Supplement. Strasbourg, France, and Lombard, Illinois: Mennonite World Conference, 1984. Mennonite World Conference website for current directories. Yoder, Amzie. "Central America." Global Anabaptist Mennonite Encyclopedia Online. 1988. Web. 20 Apr 2019. http://gameo.org/index.php?title=Central_America&oldid=104950. Yoder, Amzie. (1988). Central America. Global Anabaptist Mennonite Encyclopedia Online. Retrieved 20 April 2019, from http://gameo.org/index.php?title=Central_America&oldid=104950. Adapted by permission of Herald Press, Harrisonburg, Virginia, from Mennonite Encyclopedia, Vol. 5, pp. 128-130. All rights reserved. This page was last modified on 12 December 2013, at 15:32.